Studying verb tenses and American accent with Sharon. It’s a very hot day in the Philippines, but learning English is cool! 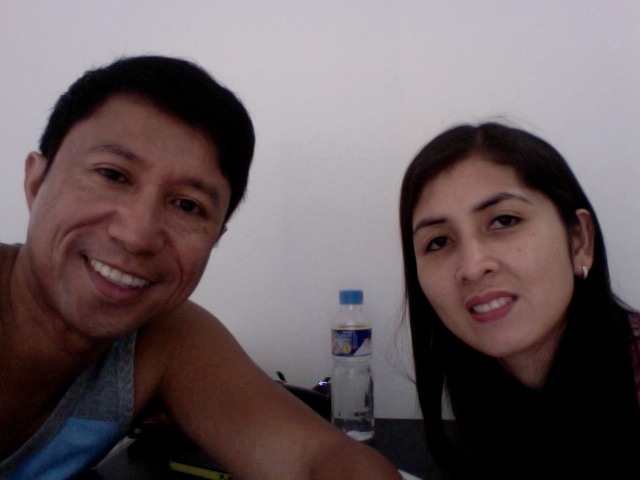 I am having my third session with my English teacher, Chris Delacruz. Today, we practiced the verb tenses: past tense. Last weekend, I was so busy because I prepared a lot for my immigration to Canada. I had many visitors at my house. My brother and sisters stayed at my house for their vacation and will stay until my husband arrives from Canada. That is why every weekend busy. On Saturday, I woke up at about 7 in the morning. I prepared breakfast for my kids and my visitors. After I cooked breakfast, I called them to join me in the kitchen at our dining table. We had fried eggs, fried hot dogs, fried tilapia, and of course rice and coffee. When we finished eating, I gave my kids a bath, and I took a bath as well after them. Then I went to the market by myself while my sister looked after my kids and her own kids and while my brother, who is a police officer, prepared to go to work. I bought groceries that would last as the next few days, such as sugar, coffee, vegetables, meat, and fish. After buying the groceries, I went home, and I placed my groceries in the refrigerator. Then I prepared pork sinigang, a sour-based soup with vegetables, for lunch while my sister was helping me to take care of the children. Example: was eating, were eatingExercise: Tell me about last night. We had dinner at about 8 p.m. last night. I started preparing dinner, dalagang bukid with sarsiado sauce, steamed fished in tomato based sauce, at about 7 p.m. While I was preparing, my mother arrived from a three-hour trip from my home province of Nueva Ecija. She was traveling on the bus when I was shopping for groceries for dinner at the market. I was very happy to see her, but she will stay only until after Holy Week. We were talking last night about my migration to Canada, and I know that she was very happy for me. She had always wanted the best for me. While we were talking, my children were watching TV and playing with their tablets, and my sister was preparing the bed. I wastalking to my mother for an hour or so until my sister joined us. The three of us were all reminiscing the past, and it brought happy tears to my mother. I will miss my sister, brother, and especially my mother very much, but I know I will visit them in about a year. Last night, we were all laughing about my stay in the province when I visited them. Every time I was cooking for the family, they told me I was very talkative. I told them I just wanted all the ingredients to be prepared perfectly so that it would taste delicious. Exercise: Tell me about your last trip. My last trip was in my home province Nueva Ecija when I visited my family and relatives. I had bought (buy-bought-bought) a lot of pasalubong or gifts a few days before I traveled with my children there. When I bought the gifts, I had gone (go-went-gone) to several markets and malls. I had searched and searched (search-searched-searched) for different gift items until I found the perfect ones for my mother and relatives. When I had found (find-found-found) the items, I was very happy because I was very tired already. I had had (have-had-had) several bus stops before I reached my home town of San Antonio near Cabanatuan City. I had had (have-had-had) several snacks from different towns because of these bus stops. Before I reached my hometown, I had seen (see-saw-seen) the beautiful rice fields and mountains in the distance, while looking through the glass window. While enjoying the sometimes bumpy ride, I had imagined (imagine-imagined-imagined) my childhood days, and how I will soon leave this beautiful province. When I finally got to my home town, I had realized (realize-realized-realized) that I will always miss and never forget this place, my home town, San Antonio. Exercise: Tell me about this morning. This morning, I woke up at about 7 a.m.. I had been preparing breakfast when my children woke up and walked into the kitchen. We had a good breakfast, and I had been talking about my husband when one of my kids told me how much he missed him. My children had been missing their father since he went back to Canada last year. I, too, miss him a lot, but I need to show to my children that I am strong, and that we will be together soon. I had been planning for my husband’s vacation in May of this year, and we are all excited. We had been eating breakfast when my mother and niece joined us. They woke up a little later than us. While we were practicing past tenses, my teacher noticed several accent errors common to Filipinos. I know that I need to practice them over and over in order for me to improve. When I talk to my husband, I will ask him to practice with me. I know I can say these phrases slowly, but my assignment is to do it naturally, that is, faster and without thinking about it. This should be fun because I am doing it with my husband. F/P – I prepared breakfast for five people. F/P – I’m a Filipino from the Philippines. TH – Bath, wrath, Cathy. I gave Cathy a bath. SH/F/V – Wash, Fish. I washed the fish five times. Previous PostHow to Give Good AdviceNext PostJob Interview Strategy: What is your Weakness? Hi Sharon. Please make sure you do your practices so that you can improve. I have seen you improve already, but I know you can improve so much more. Read and read this article. Practice your tenses by posting here. Don’t forget to practice your American accent as well, especially our F and P.